Scientific Name(s): Hygrocybe miniata (Fr.) P.Kumm. The fruiting body of Hygrocybe miniata, or vermilion waxcap, is scientifically known as its basidiocarp. Its vibrant colouration makes it stand out on the dull forest floor. Hygrocybe miniata is a cosmopolitan species, i.e., a worldwide distribution. The basidiocarps are typically coloured anywhere from vibrant red to pale orange; few of these grow to more than 7 cm (~2.5 in.) in height. The generic name Hygrocybe originates from the Greek words “moist” and “head”, while the specific epithet suggests “red-coloured”. This genus comprises around 150 recognized species of often brightly-coloured agarics, some of which are considered to be edible. In the field, vermilion waxcap can prove difficult to identify due both to its similarity to some other Hygrocybe species and its morphological variability. Taxonomic classification of fungi without the help of genetic tools is no easy task; it took mycologists 50 years after Hygrocybe miniata was first described to assign it to its current genus (though it has remained there since 1871). Although it’s difficult to identify on macroscopic features alone, the vermilion waxcap is one of few species in the Hygrophoraceae with a scurfy-textured, rather than greasy-textured, cap. The colours and forms of fungi around the world can seem almost impossible to believe. I urge BPotD readers to check out Ken Beath’s other photos on his Flickr page (link) to see the amazing diversity of fungi he has encountered in Australia. I appreciate the unique perspectives achieved through macro photography of the microenvironments and organisms that often go unnoticed. Particular scenes that I am keen to photograph one day are those showing close-ups of mushrooms that almost resemble trees in a forest. Several webpages seem to agree that the total number of fungal species in Australia is estimated to be around 250,000, of which only 5% are currently described. The Wikipedia page dedicated to the fungi of Australia also mentions that “at governmental level, scientific neglect of Australian fungi continues”…due to the fact that fungi are merely mentioned once as a photo caption in the National Biodiversity Conservation Strategy (PDF) currently in place for Australia until 2030. Wow, that is beautiful, but it looks toxic enough to kill an elephant. The fact that thee is just a single bite out of it has me wondering if there was some little corpse nearby, victim of the toxins within. What distinguishes this species from H. coccinea? I’m sure there will also be microscopic differences, but I don’t have the resources available in our library to comment on those. 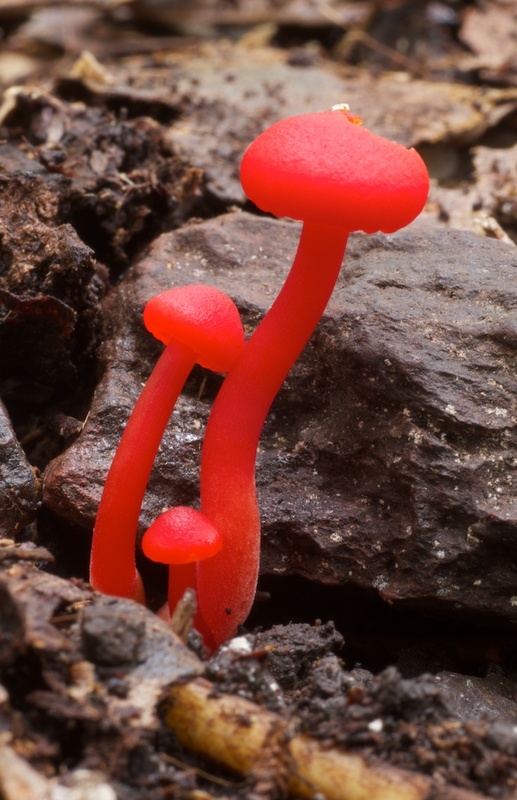 Here’s the old BPotD entry on Hygrocybe coccinea, for reference. Might get into trouble separating H. miniata from H. coccinea based on cap size. You are correct about what the key says, but other resources suggest this is not a reliable distinction. In WaxCap Mushrooms of Eastern North America the cap size of H. miniata is listed as being between 2 and 4 cm while the cap size of H. coccinea is listed as being between 2 and 7 cm. In North American Species of Hygrophorus, the authors Hesler and Smith give a size for H. miniatus or between 2 and 4 cm whereas they give the size of H. coccinea as between 2 and 5 cm. Yes, I had my reservations about it. I wonder if anyone has ever done a study on the most ambiguous couplets in identification keys. Overlapping sizes has to be one of the worst. Thanks so much for leading me to Ken Beath’s work. The two of you give us unlimited canvasses of the creator’s work. The colors, textures, and compositions are beyond the imagination of mortals. “Scurfy-textured!” I learned a new word; thank you for that, Dominic. It’s amazing that only 5% of Australia’s mushrooms are described; so much work remains to be done. Thanks too, for the link to Ken Beath’s Flickr page – you’re right, he’s managed to show a brilliant variety of forms, on just the first page. I don’t know of any fungi that brilliantly colored in the U.S., at least not here in the Pacific Northwest. You couldn’t miss that on any forest floor. Wouldn’t that be pretty in a salad, assuming it really is non-toxic! Could you weigh in on why a mushroom species would be selected over time for and eventually end up such a striking color? Evolutionary advantages versus costs? Bright colors can mean inedible or edible and delicious, can broadcast ripeness and thus seed maturity but, in the case of mushrooms, has anyone ever weighed in on why they evolve toward such stunning colors? And this against the backdrop of color being seen differently by different organisms that eat mushrooms if seen at all. Thanks. I might have to hit the books on why the diversity of colours evolved (tomorrow, when I’m back in the office). I’m coming up empty on a cursory search on Google Scholar. Coming back to this after a bit of researching. I haven’t been able to find any research on the topic, so either I’m not looking for the right terms, or there is a gap. The specific name is specific to the hue of red, minium is red lead, lead tetroxide. Red lead is a striking deep orange-red much the same colour as that fungus and previously much used as a pigment. *nod* Thanks, I’m sure I’ve written about that in a previous entry, but missed it in doing the edits on this one.